For similarly-titled media, see Sonic the Hedgehog 4 (disambiguation). 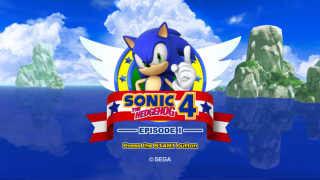 Sonic the Hedgehog 4 is the collective term for two episodic Sonic the Hedgehog video games; Sonic the Hedgehog 4: Episode I and Sonic the Hedgehog 4: Episode II, released in 2010 and 2012, respectively. It is a sequel to Sonic the Hedgehog 3 & Knuckles, marketed as being a return to the franchises' 2D roots. During development the game was codenamed Project Needlemouse, after Mr. Needlemouse, a name given to several early prototypes of Sonic. While overseen by Sonic Team, much of the development was handled by long-time Sonic collaborators, Dimps. Sonic the Hedgehog 4 is set shortly after the events of Sonic 3 & Knuckles and takes place before the events of "Sonic Adventure". After Sonic manages to destroy Doctor Eggman's space station, he decides it is time to take a much deserved break. After parting with his companions Tails and Knuckles, Sonic sets off to explore new territories alone. Episode II primarily focuses on Sonic's rivalry with Metal Sonic, following on from their last encounter during the events of Sonic CD. Tails also joins Sonic in this episode. Eggman uses Metal to keep Sonic at bay while his plan gets put into motion, which is a new Death Egg. Sonic 4 attempts to replicate the feel of the Sega Mega Drive Sonic games with elements such as side scrolling levels and classic-style badniks. Each zone features 3 acts, similar to Sonic 1's design, along with a boss act. The Homing Attack and Spin Dash are present. Monitors return in this game, and power-ups attainable from them include the Speed Shoes, Shield, and Invincibility. Special Stages are present, with Episode I's being based on Sonic 1 and Episode II's being based on Sonic 2. In both games, if all 7 Chaos Emeralds are collected in the Special Stage and 50 or more rings are collected the player will be able to transform into Super Sonic, a feature which has not been implemented in regular levels in an action Sonic game since Sonic 3 and Knuckles. The transformation is activated by pressing a button that is not Jump, making transforming into Super Sonic less likely to be accidental. In the Wii version, it's simply the button, while on the 360 it is the / buttons. On March 22, NGamer revealed that the game will have 3 Episodes, each comprising 4 Zones. Each Zone has 4 Acts, the last of which is a boss battle with Sonic's perpetual nemesis Dr. Eggman. Sonic the Hedgehog 4 is a controversial game among fans of the Sonic franchise. Sonic's post-Sonic Adventure appearance was met with outrage from fans who were expecting the original Mega Drive look, to the point where a petition was started. Year after year there are stories of perceived low quality in graphics, music, and gameplay. Episode II has a slightly better reputation but is still considered to be "more of the same". The sheer amount of outrage may have lead to Episode III being canceled. This page was last edited on 17 November 2017, at 10:36.